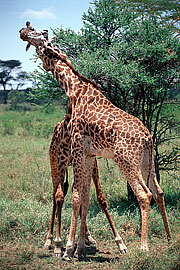 Description: On this picture two male giraffes are fighting for the female giraffe. About 30 minutes later the female gave up and left the scene. The males did not notice (or did not care). The fight is spectacular. 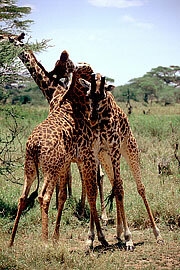 The males have body contact and try to push the opponent to the side. 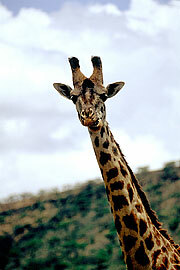 Also note the horns of the giraffe. The giraffe swings and twists his neck and the opponent is hit with the horns. I can assure you that they hit very hard, the sound of the horn hitting the opponent is impressive.